EarthTrekGear Folding Collapsible Travel Hiking Trekking Pole. Compact. . . Collapsible . . . Easy to carry. Folds down to 12". Stashes easily in luggage, backpacks, and carryons for outdoor and air travel. Includes many top benefits of standard hiking poles, including shock absorbing rubber tip. Great for International travel too. 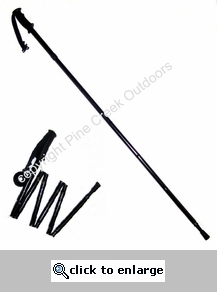 (Please see our "Folding Trekking Travel Hiking Stick Pole" for those who need a standard taller pole. Available in our "Hike and trail gear" category). Recommended accessories: Shock-absorbtion Pole Tip foot:Made of long lasting durable rubber which helps reduce slippage on surfaces. Improves shock resistance on hard surfaces. Ideal for use while walking on smooth, rocky and hard terrain. Makes hiking low impact on your body and more comfortable. Hiking Pole Round Replacement Tip Set:Replacement rubber tips. Tips will eventually wear due to use. It is always good to keep an extra set in case of loss or wear. Our tips and feet come in a set of (2) in each package.